1 Sunny & hot day. During afternoon invading cirrus and altocumulus castellanus virga. Towards the evening a very nice circumzenithal arc. Top Tmax today: Kleine Brogel 31,5°C, Diest 31,4°C, Deurne 31,0°C, Brasschaat 30,2°C, Liège 29,4°C, Chievres 28,9°C, Charlerloi 28,8°C and Zaventem 28,7°C. 2 Towards morning further increasing clouds and between 0930-1000 outbreak of a moderate thunderstorm with light rain: 1 mm in the collector. Rest of the day rather cloudy and hazy to. Around 1800 serious developing TCu over the north with black skies but remaining dry and moving out of the area. This turned out to be a severe splitting thunderstorm over SE and E Netherlands and W Germany. Over there the right mover survived and turned into a bow-echo with damaging winds. Maximum collected rainfall in Belgium: Deurne 12 mm. 4 Very cloudy night. Light rain between 1000-1230 followed by a few breaks. Becoming very cloudy from 1600. Intermittent light rain and drizzle from 1700 on. Cold NNW wind with afternoons T barely above 10°C. 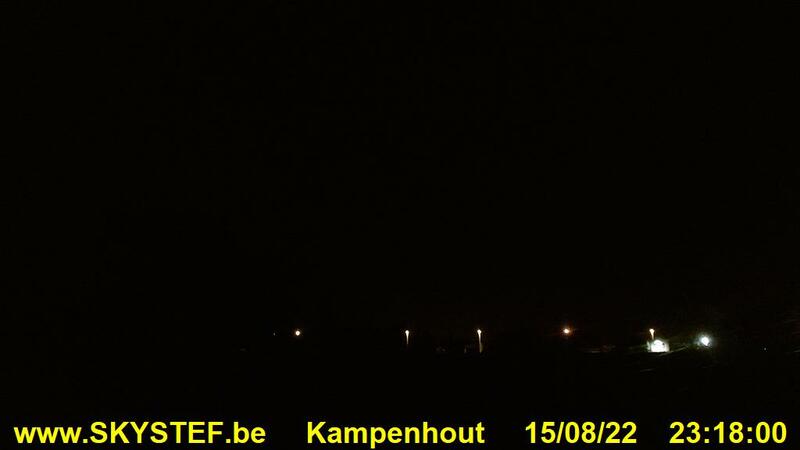 Today a few weak thunderstorms were observed at the province of Namur. 5 Mostly cloudy to very cloudy with Sc sheets. During afternoon a few nice breaks. Around 2300 some slight rain. 6 Slight rain between 0200-0700: 2 mm. A light shower of rain with small hail did occur around 1000. Afterwards dry with Cu skies. Towards evening invading cirrus. 7 Rain between 0500-0800 followed by moderate showery rain till 1000. Thereafter sunny spells with cumuliform cloudiness. Once in a while a moderate shower of rain, even a rumble of thunder around 1830. A day total of 16 mm water was collected. Weak thunderstorms did occur today over all provinces except for Luxembourg. 8 Partly cloudy night. During forenoon building up TCu with around 1100 a first shower of light rain and small hail. Repeated a couple of times in afternoon. Largest stones were around 0,5 cm. Tmax barely 13,0°C. During afternoon weak thunderstorms did occur over provinces of West-Flanders, Brabant, Namur and Liége. 9 Light rain shower around 0300. Situation of yesterday was repeated: light rain showers with small hail starting from noon. Weak thunderstorms did occur today over provinces of Limbourg, Brabant, Hainaut and Luxembourg. Tmin at Buzenol : -1,0° ! 10 Clear night with a bit hoar frost: my Tmin was 1,7°C. Five stations in Belgium had negative Tmin: Mont Rigi -1,7°C, Elsenborn -1,4°C, Brasschaat -0,5°C, Spa -0,2°C, Buzenol -0,1°C. After as sunny start a repeat of yesterdays situation: developing showers with small hail from 1230 on. Weak thunderstorms did occur today over the province of Limbourg. Top Tmax barely 14,0°C at Kleine Brogel. 11 Clear night with gardens Tmin 1,1°C. Two stations in Belgium had negative T: Brasschaat -0,9°C and Dourbes -0,8°C. Cloudy Sc Cu day but clearing skies towards evening. 12 Clear night. Elsenborn had Tmin -0,2°C. Besides a few fair weather cumuli sunny conditions with quite strong easterlies. 17 Last night passage of weak cold front giving 1 mm in the collector. Cloudy Cu Sc day with a few spots of rain around 1800. Clearing skies after sunset. My Tmax barely above 12°C, top Tmax Belgium: Kleine Brogel 14,6°C. 18 Clear night with Tmin in garden of 0,7°C. Officially there were nine stations with negative air temperatures: Brasschaat -2,1°C, Elsenborn -1,1°C, Dourbes -0,9°C, Spa -0,8°C, Retie -0,6°C, Kleine Brogel & Buzenol -0,5°C, Mont Rigi -0,4°C, St-Hubert -0,2°C. Lowest Tmin at surface: Elsenborn -8°C. Developing Cu clouds during forenoon again dissipating towards sunset but with increasing cirrus. Some dust whirls were observed around 1500. Top Tmax at Diest 16,0°C. 19 One station had negative Tmin: Elsenborn -1,6°C. Cloudy Ci Cs, towards evening very cloudy Sc Ac. Slight intermittent rain from 1900 on. Top Tmax: Kleine Brogel 21,1°C. 20 Cloudy and warm day with T around 22°C. Top Tmax: Kleine Brogel 24°C. Around 1700 a slight shower. Around 2130 lightning & 2400 lightning & thunder in the west, followed by moderate showers of rain. 7 mm in the collector. During the evening some severe thunderstorms developed over SE Belgium, including two bow-echos over province of Luxembourg. On the cold front, over Oost-Vlaanderen, there was also moderate thunder activity with a lot of CG strikes. 21 Passage of cold front around 0200 with a moderate shower of rain: 2 mm of rain. During the day a mixture of sun & Cu clouds. Around 2200 weak thunderstorm with gust front cloudiness giving 2 mm rain. Multicell thunderstorms developed during afternoon over Flanders except for Limbourg. Also TS at Hainaut. Hail of 1 cm was observed at Bruges. 22 During the day a mixture of sun & Cu clouds. Between 2030 and 2130 passage of a couple of light rainshowers. A few light to moderate multicell thunderstorms did develop over West and Oost-Vlaanderen during late afternoon. 23 During the day a mixture of sun & Cu clouds with during afternoon some slight rain showers. 24 Cloudy day with slight rain around 1200. During the afternoon for hours very beautiful Sc lenticularis clouds. Sometimes corona in thin Ac sheets was visible. 25 Sc cloudy forenoon, breaking during afternoon and finally becoming scattered Ac + Ci. Top Tmax: Kleine Brogel 27,1°C. 26 Sunny day, during afternoon some Ci Cs cloudiness. Top Tmax: Kleine Brogel 31,1°C, Diest 30,5°C, Bierset 30,3°C. 27 Sunny summer day, with except for higher parts of Ardennes everywhere > 30°C. Top Tmax: Kleine Brogel 34,3°C, Deurne 32,9°C, Liège 32,8°C, Beauvechain 32,6°C, Koksijde 32,3°C. Zaventem had 31,6°C. Coolest spot: Elsenborn 29,1°C. 28 Another summer day with some Ac sheets around 1500. Top Tmax: Kleine Brogel 31,0°C, Elsenborn 29,1°C. 29 Partly cloudy forenoon, increasing cloudiness after 1500. Slight intermittent rain from 2100 on. Top Tmax: Kleine Brogel: 25,2°C. After 2000 formation of a severe MCS thunderstorm over provinces of Luxembourg and Liège. 30 Rainy till 0200 giving 2 mm. Most rain over 24 hrs (0800-0800) fell in the west and east: Koksijde 18mm, Elsenborn 17mm. Remaining overcast with St Sc clouds. From 1000 showery rain till 1500 giving 6 mm. Clearing skies from 1800 on. Top Tmax barely 14,3°C at Bierset. 31 Developing Cu clouds during forenoon. Around 1700 moderate rainshower: 3 mm. A few weak thunderstorms did occur in afternoon over province of Antwerp.